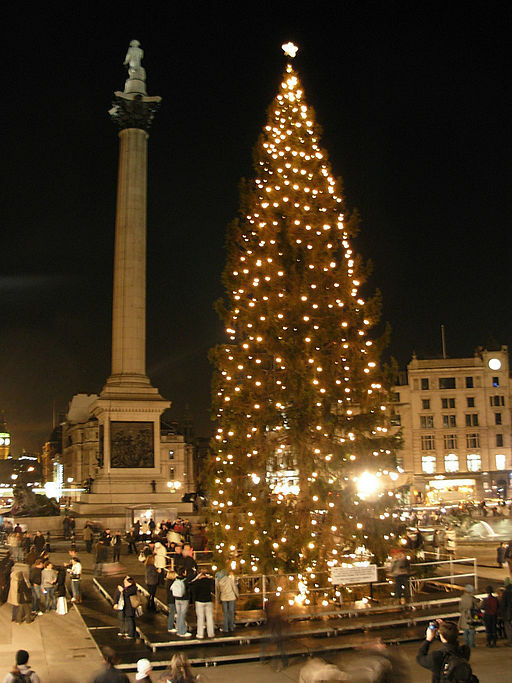 A seventy foot, sixty year old Norwegian Spruce has been annually ‘replanted’ every Christmas since 1947 into Trafalgar Square. The tree had been selected and felled during November at a ceremony in Oslo’s forest attended by the Lord Mayor of Westminster. This majestic evergreen is donated to the people of London by the residents of Oslo in recognition of the friendship between the two cities. 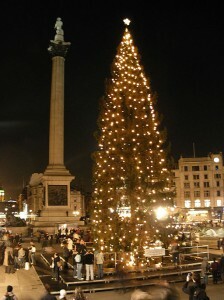 The tree is prominently displayed in the square twelve days before Christmas, after being uprooted from the forest surrounding Oslo and sent by cargo ship across the North Sea to Immingham Docks, then on by road to Trafalgar Square. After the mammoth task of erecting the tree, it is bedecked, Norwegian style, with over five hundred white lights. The switching-on ceremony is held on the first Thursday in December while the band plays and a choir sings Christmas carols. Again, the Lord Mayor of Westminster is in attendance. “This tree is given by the city of Oslo as a token of Norwegian gratitude to the people of London for their assistance during the years 1940-45”. During 1940, Norway, as with most of mainland northern Europe, was invaded and in the grip of hostile German forces. King Haakon VII had escaped to Britain, and a Norwegian exile government had been formed in London. To the majority of Norwegians, London represented the spirit and symbol of freedom during those difficult years. It was from London that the latest war news was broadcast in Norwegian, along with information which became vital to the resistance movement and gave the Norwegians inspiration and hope of liberation from their Nazi oppressors. The Christmas tree, a symbol of friendship and freedom, ironically began its popularity in Germany with the tradition quickly spreading here in the U.K. after Queen Victoria’s German-born Prince Consort, Albert, sent decorated trees to Windsor’s schools and barracks. A drawing in 1840’s The Illustrated London News showed the royal children at Windsor decorating their tree with oranges, biscuits and candles. The British population, after reading this paper, soon began to emulate these traditions in their own homes, and the decorated tree swiftly became a part of English Christmas culture. Moreover, London is not the only British city with strong links to Norway and nor is the Trafalgar Square Norwegian spruce the only one in Britain. On the contrary, there are several. Not only are these connected with wartime gratitude, they also stem from the Viking settlements on our northern coastline and the cultural influences these impacted on Britons which still exist today. In Newcastle, they have for more than sixty years been presented with a Norwegian spruce from their twin town of Bergen; whereas Sunderland is presented with their tree from Stavanger, as is Aberdeen. Grimsby has Sortland to thank for their tree, and Edinburgh’s tree and the Orkney Islands Council have the people of Hordaland to thank for theirs. Kirkwall get their own special tree from Grimstad. It is a tradition of friendship and gratitude and long may it continue. MERRY CHRISTMAS!